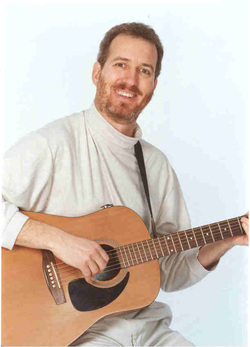 "Robert the Guitar Guy has performed several times at the Wilton Library Association in the past two years. He always plays to a full house -- one time there were more than 200 people at the performance, and there would have been more if they could have fit in the room. "He has continued to delight our large audiences of children and adults with his voice, his guitar, and his personality." "His command of his material and his obvious love for music had a wonderful effect on the audience. When the show was over we heard the kids commenting on how much fun they had and the parents giving their voice of approval with nothing but positive comments about the show." "You involve the children totally in the make believe you create. Your guitar work is exquisite!" Melissa Coury, Library Director Sherman Library, Sherman, CT.
Lisa Pichnarcik, Librarian Fairchild-Nichols Library, Trumbull, CT.
"Through the creative use of puppetry and storytelling, Robert teaches children about values and interpersonal relationships. Children leave Robert's musical sessions with newfound self esteem."